New! 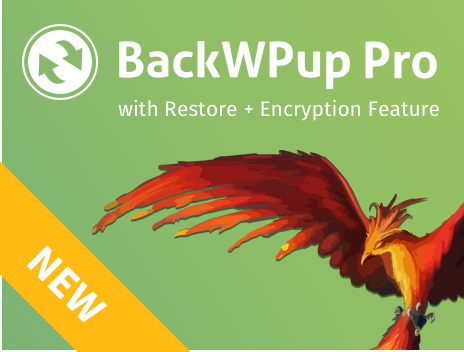 – BackWPup PRO with Restore function! Already over 8 Million Downloads! BackWPup uses the WordPress Cronjob system (WordPress Cron), to execute scheduled backup jobs. WordPress has no internal clock, so it checks the server time regularly and runs activities that are due. This happens every time someone (or yourself) is browsing your website. If no one visits your website for some time, it can lead to some trouble with the Cron. In this case, a Cron job on the server needs to be set up, which regularly calls the URL http://yourdomain.com/wp-cron.php. Create a new post and set the publish date in the future. 10 Minutes are enough. Log out of WordPress and close your browser window (this is important!). After 11 or more minutes, check if your post was published. If not, something is wrong with the WordPress Cron. If you encounter problems with starting backup jobs via WordPress Cron, the setting option Start job with EasyCron.com can be considered. Then you don’t need traffic on your website to start the backup jobs at the desired time. EasyCron is especially helpful, if your webhost does not allow loopback connections or does not offer Cron jobs on the server side. If you purchased BackWPup Pro, please login with your credentials on our Support page. If you are a free user, please open a ticket on wordpress.org.